What i had ordered was two soaps, a shower gel and a sample basket. I love the concept of a sample basket... it lets you try a variety of products so that you can take a pick of what you actually like and then you can order the full sized product. 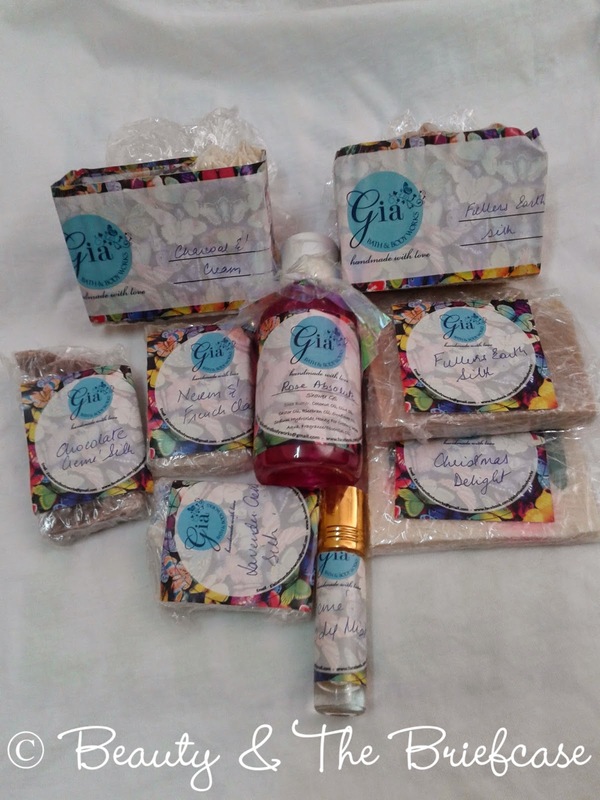 A little bit about the brand: Gia Bath and Body Works is a brand committed to making Handcrafted Luxurious treats to pamper your skin. We make exquisite Handcrafted bathing bars and skin care products In small batches while carefully choosing our ingredients and creating attractive body treats with unique designs and textures. Our Soaps are packed full of fine ingredients, such as Liquid Silk, Fresh Cream, Colloidal Oatmeal, Goats Milk and precious oils of Virgin Olive, Virgin Coconut, Avocado, Jojoba, Sweet Almond and Castor Bean. Creamy butters like Cocoa, Avocado, Mango and Shea. None of our products contain harmful chemicals or fillers to bulk out products, They do not contain any SLS, SLES, preservatives or hardeners. just the raw Natural & Pure ingredients.They are suitable for most skin types. I have already used up quite a lot of the samples so they aren't pictured. 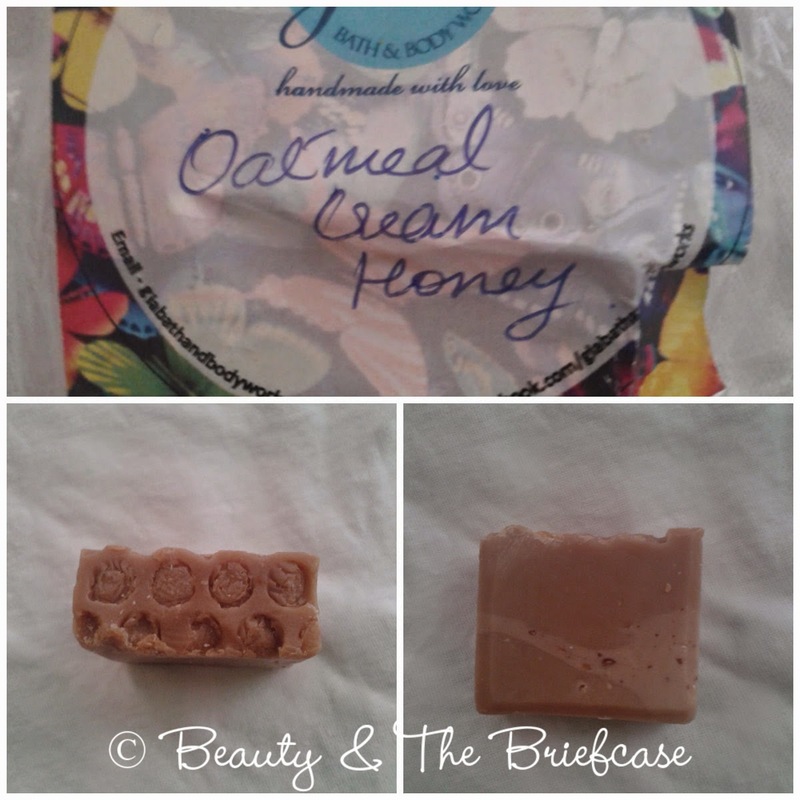 Currently i'm using the Oatmeal Cream Honey Soap. I'm honestly in love with these products and once i'm done with this lot i will be ordering more soap bars. I usually prefer shower gels but these soap bars are so moisturizing. Hi Jhilmil... I completely forgot to mention the prices on the post... will update it! Anway the sample basket is for Rs.399! Thanks Natasha... They look and smell so yummy i just feel like eating them! The sample basket concept is really nice... i really got to try a lot of products because of it which i may not have ordered otherwise!